Tisdale is one of the fastest players for the class of 2019, and is a complete blur moving down the field. He can hit a hole, and really explode by all levels of the defense. His sprinters like running stride is really amazing and you just cannot teach the speed he displays. He put up outstanding numbers both his soph and junior year, and was one of the state leaders in rushing for the class of 2019. His athletic burst is a game changer, and he can turn a simple dive play into a long touchdown in just a blink of an eye. Really encouraged with his hands too, Tisdale looks like he could be one of the top all-purpose backs in the entire country. 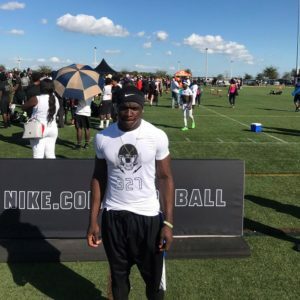 Power 5 schools will be lining up to get the 2019 star back on their campus.